N.B. This version is from We Flew In Burma. For two years UBA crew rosters changed little. We had some South Africans. A couple of Australians, but English pilots were the main group. One of these was Capt. Alex Hare. He tells an exciting but frightening story. 'The dawn of June 26, 1954, would break as usual. It began as just another work day. A sky-jack would change normality. Dacoits would grab my plane. I would witness murder. Then with my death just a trigger press away they let me go! 'I set my DC3 on track over Mingaladon for Akyab. There were eight of us on the plane. We were having a smooth run. The coast was just ahead. I glanced to port and there was Sandoway. We were spot on course! 'Then, all hell let loose! A trio of pistol-packers forced their way onto my flight-deck. They backed up their guns with hand grenades. They were in over-kill mode. No objections were coming from me! 'With a cannon jammed into my right ear-hole they told me to land. I asked. "Where?" One of them pointed to a beach. The sand was hard. My landing was smooth. A surprise under the circumstances! 'They knew what they wanted. With generosity they let me off-load their loot. My custodial worry of 200,000 pounds' sterling was no longer a burden. 'Their affluence was of short duration! They were nobbled in turn. Another band of brigands took over their loot. 'Then things took a nasty turn. They shot my trio of sky-jackers. Steely eyes strayed over the rest of us. Then without a word the killers turned away. They took their loot to the water's edge. There they stripped and took a swim. Alex has told his story with flippancy. This merely showed the depth of his concern. All that had happened in a couple of hours. Most men do not face such terror in a lifetime. Map showing track to the skyjacked beach landing north of Sandoway. N.B. This version is from Syd's Last Pirate. Captain Alex Hare had an experience that could have brought him death. He tells the following with tongue-in-cheek humour, but I’m sure there was no levity as the situation unfolded. In June a trio of bomb and pistol packing dissidents skyjacked my DC-3. 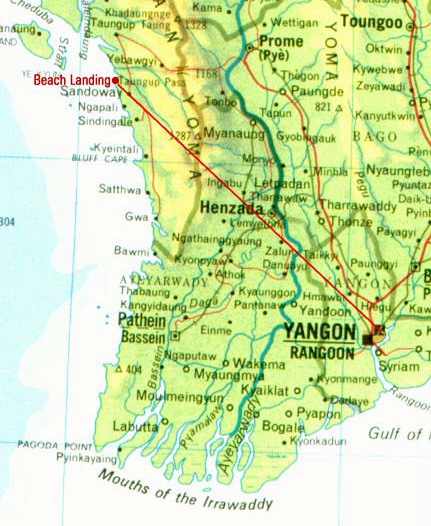 With a pistol in my right ear they forced me to land on a beach near Sandoway on the Arakan coast. There they joyously relieved me of my custodial worries by purloining £S200,000 in currency. In true democratic style they allowed me the privilege of conveying the boodle to the tide line. Yet, their elevation to affluence was short-lived. Another equally joyous band of brigands screamed out of the trees and nobbled and murdered the first lot. Having disposed of the opposition they turned steely eyes upon my crew and me. Just, as things seemed lost, for no apparent reason they stripped and took a swim. As they splashed in the water like innocent children I herded the crew aboard. The starboard engine started without a whimper but the port engine ground away until it suddenly burst into life with bangs and blue smoke. The pirates, dressed only in guns, reached the starboard wing tip as I slammed the throttles open and scuttled off downwind.